Every once in a while, it’s nice to eat something that’s a kick-back to the pre-Paleo days: something salty and reminiscent of burger drive-throughs without being a total gut-killer. 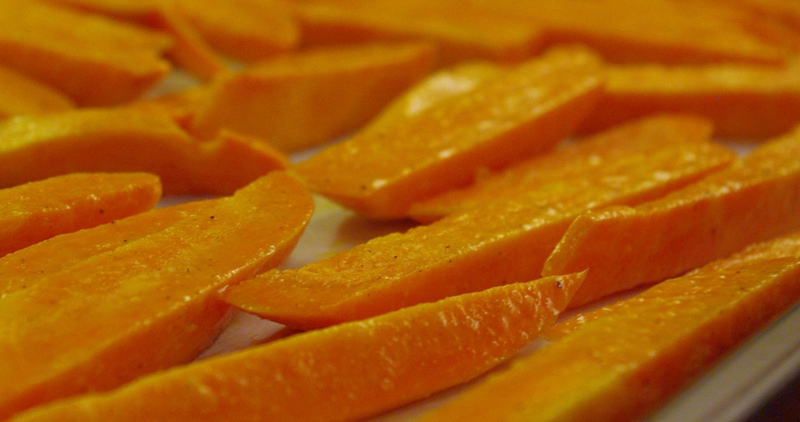 Sweet potato fries definitely fall into that category. The combo of sweet and salty really hits the spot, especially alongside a good steak or bacon burger (bun-less, of course!). Yum! My wonderful brother-in-law M made these when we were up in Connecticut a few weeks ago, so I had to give it a shot in my own kitchen. Preheat oven to 450 degrees F. Line a rimmed baking pan with a piece of parchment paper. 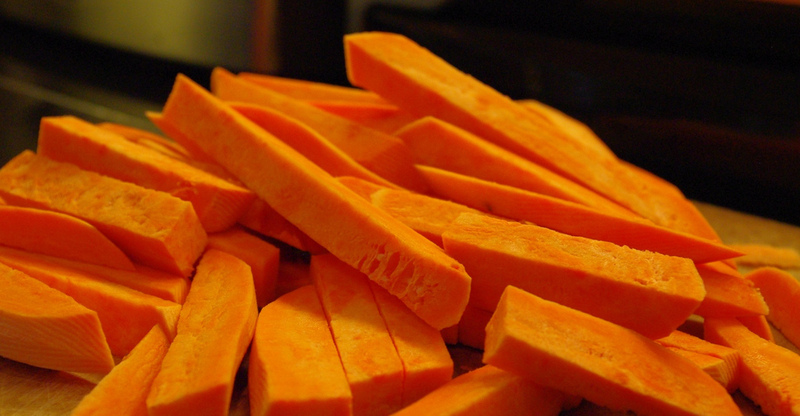 Prep your sweet potatoes… You can either peel or leave the skin on – it’s really personal preference. If you do leave the skin on, make sure you give the spuds a good scrubbing first. Slice your potatoes into large fry-shaped sticks with as uniform a thickness as you can. In a large bowl, toss together your potatoes, coconut oil and liberal salt and pepper. Get ’em all coated and the spices evenly distributed. Transfer your potatoes to the parchment-lined baking sheet… you’ll want the potatoes laying flat (not piled on each other) with a little bit of breathing room between each. Pop the potatoes in the oven for 15 minutes. At 15 minutes, pull ’em out, use a spatula to flip, and then put ’em back in for another 10 minutes or so. Keep an eye to to make sure they don’t scorch. Once they’re done, let them cool for a few minutes and transfer to a serving dish. I find that they don’t really need much of anything else – the combo of sweet and salty with the softer, “baked fry” texture is delightful. My husband & i started paleo 4 days ago. 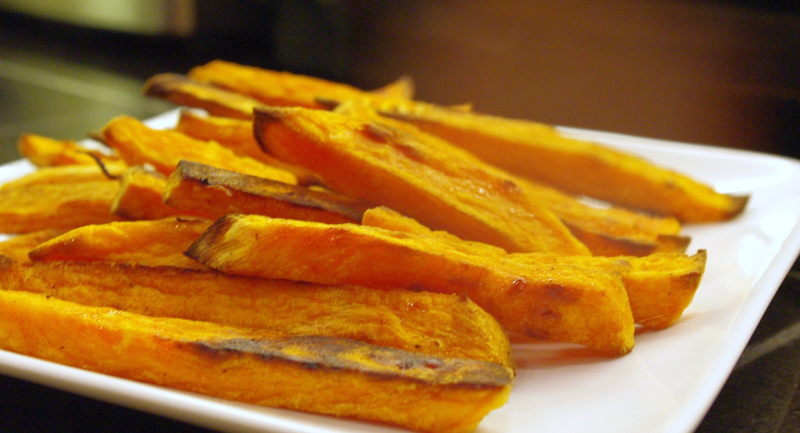 I just tried baking sweet potato fries tonight & they were quite soft. Do u get them to be crunchy like regular fries? Or are they never going to get like that? Hi Lauren! Congrats on starting Paleo! How’s it going? 🙂 It took me a few weeks to really get in the groove… Hope you like the fries – I know they’re not quite like a traditional crunchy french fry. Because they’re baked, not fried, you won’t get that crunchy/crispy texture, but hopefully you love the taste as much as me! Hi Lisa – Congrats on working to make this change! It is definitely not easy, but the results are so worth it… you really will feel better. For a good rundown on Paleo, I suggest checking out some of the links on this page: https://paleobetty.com/about-2/link-love/ Specifically, the ones under “living and eating paleo.” The best bet is to start slow – pick a few recipes to try at a time so it’s not overwhelming. I find that my local organic grocery has a really good deli turkey with no preservatives/antibiotics/etc. that is great in a pinch if I can’t cook. I also eat a LOT of salads of different kinds since they’re easy to throw together. For snacks, I carry around a bag of raw almonds, though I limit my intake to about 20/day (you want the good fat, but you don’t want to overdo it).